Despite its small size and apparent insignificance, No. 15 in Frog Street left was one of the Exeter's historically interesting buildings, a lone survivor and a unique example of its type. Situated just beyond the city walls and the West Gate, and on the edge of the industrial area known as Exe Island, Frog Street had largely retained its medieval appearance late into the 19th century, with gable-ended, timber-framed houses from the 1400s and 1500s lining both sides of the narrow route, their upper floors oversailing the street below. The street's picturesque character was gradually eroded through sporadic demolitions in the first three decades of the 20th century until, in 1961, just two of the street's historical properties remained. One stood on the corner of Frog Street and Edmund Street. 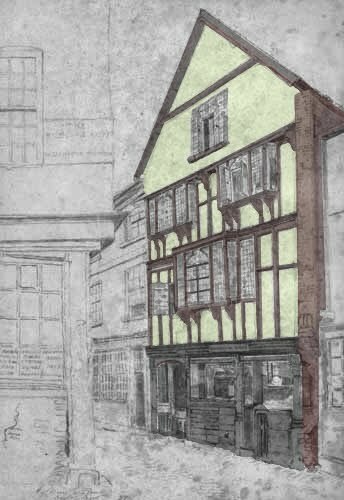 A small mid-15th century merchant's house, it was salvaged and gained some local fame as "The House that Moved" when it was transported on wheels into a new location on West Street. No. 15 Frog Street wasn't so fortunate. What made it a unique survivor was its layout. Unlike the other timber-framed houses that survived in Exeter into the 1960s, No. 15 was built with its roof parallel with the street. Derek Portman in his book 'Exeter Houses 1400-1700' suggests a plausible explanation for why this layout was less commonly seen in the city centre. The importance of having street frontage in the commercial centre of Exeter was paramount. It was therefore customary to have long, thin plots of land (burgage plots) at right angles to the street with narrow shop fronts, thereby maximising the number of properties that could be built on any given thoroughfare. Frog Street's location beyond the city walls meant that there was simply more space to build and so wider street frontages were both possible and desirable. According to Portman "only one building of this kind, No. 15 Frog Street, remained to be surveyed". The photograph right shows the entrance into Frog Street from Edmund Street c1940 with No. 15 highlighted in red. The white timber-framed property on the right, demolished c1950, appears to have had a similar layout to No. 15. No. 15 was built c1570 and was typical of the sort of house occupied perhaps by a successful late-Elizabethan tradesman. It was timber-framed and was built on two floors with stone party walls at either end (although at some point the western wall had been rebuilt in brick). Access into the property was originally through a side passageway that ran underneath the first floor and out into a courtyard at the rear. Entry into the house itself was via a doorway in this passageway. On the ground floor was a single large room with a fireplace in the eastern wall. The first floor was divided into two rooms by a studded partition which, according to Portman, was "completely preserved and visible". The 16th century roof structure had also survived with little alteration. The property had been extended at the back, probably in the late 18th century, but the overall plan of the Tudor building was "easily discernible". Unfortunately Frog Street was in the firing line of the council's inner bypass road system, first proposed by Thomas Sharp in 1945. 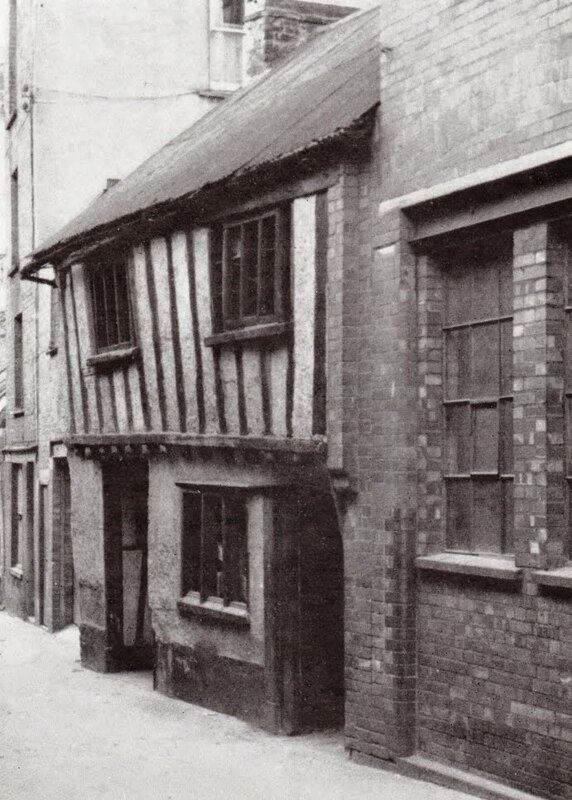 As the bypass edged its way towards the river in the late 1950s and 1960s dozens of historical properties were demolished, including a large number of mid-17th century houses at the Southgate, the city's earliest brick-built house on Magdalen Street and Dr Dicker's early-18th century mansion. No. 16 Edmund Street was saved from destruction and moved, but No. 15 Frog Street was to have no such reprieve and in the summer of 1961 it was torn down. 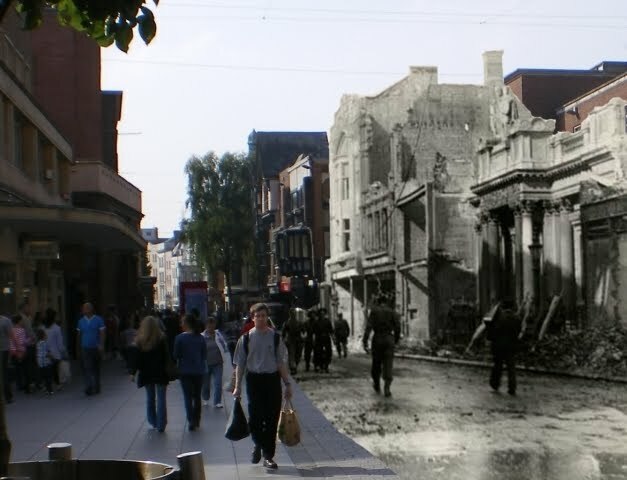 Another of Exeter's city centre streets and another story involving the complete loss of a historical cityscape. 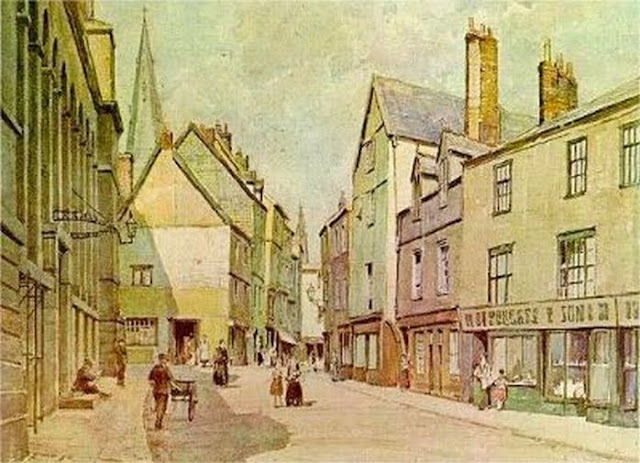 The watercolour above is a rare depiction of Guinea Street c1900, looking towards its junction with South Street. The spire of the then recently rebuilt church of St Mary Major is in the background. To the left is the monumental main facade of Charles Fowler's Lower Market, the street still lined with a number of timber-frame properties from the 1600s and 1700s. Nothing remains today of any of the buildings shown. The map below right shows Guinea Street and the surrounding area c1900, at about the same time that the watercolour was executed. The Lower Market is clearly visible as is Milk Street, with its little obelisk and public square, as well as Sun Street and the entrance from South Street into Guinea Street. Very narrow lanes led off into semi-hidden places like Rowe's Court or provided shortcuts into the surrounding streets. 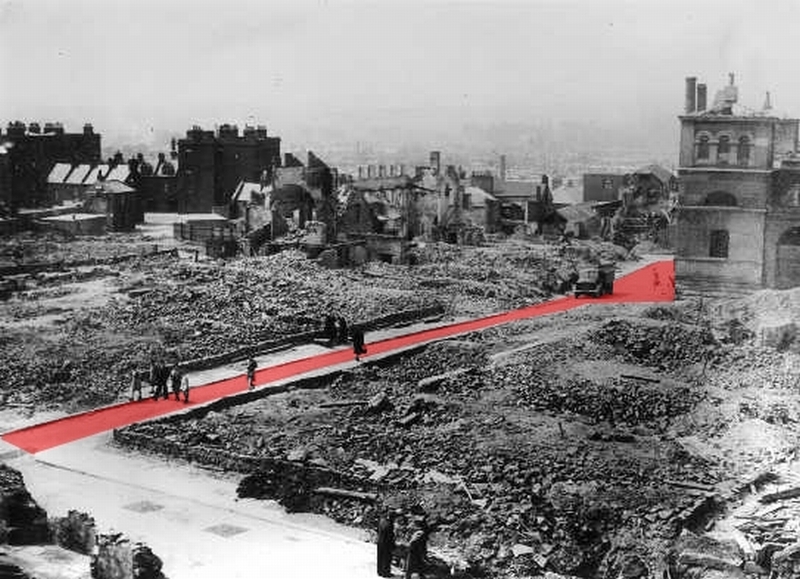 The parts of the map highlighted in red show areas that were affected during World War Two and which have since been rebuilt. The street's name is recorded in 1320 as 'Gennestrete', in 1421 as 'Gyne Stret' and in 1610 as 'Gennystrete'. It's thought that 'Guinea' is derived from 'ginnel', a word for a narrow alley or passageway that is still used in some Northern dialects and which is believed to originate in Old Norse. 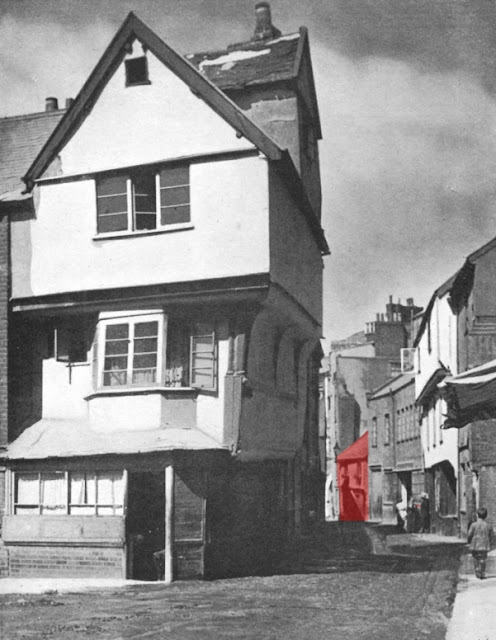 Situated off South Street and sandwiched between George Street and Sun Street, Guinea Street was part of Exeter's sprawling West Quarter, one of the city's most significant residential and commercial districts throughout the Middle Ages. Before that the area covered by Guinea Street had been within the footprint of the mid-1st century Roman legionary fortress, later transformed into a civitas cAD 80. A "mass of masonry" from a Roman building was discovered in October 1838 when new curb stones were laid in Guinea Street and various pieces of Roman pottery and coins were unearthed throughout the 19th century. It's now thought that the masonry discovered both then and since, as well as the remains of tessellated and concrete floors, belonged to buildings associated with the Roman public bath complex sited near the present-day Deanery on the other side of South Street. A quarter of the street was demolished in 1835 for the construction of the Lower Market. The market's 127ft (39m) Guinea Street facade above would've dominated the narrow medieval street in much the same way that the Higher Market's rear facade towered over Goldsmith Street. The market was set back from the original line of the street frontages it replaced, doubling the width of Guinea Street in the immediate area outside the market itself but leaving the portion that exited onto South Street intact, an effect that can easily be seen in the watercolour view at the top of this post. No great historical events occurred in Guinea Street and apart from the Lower Market it's unlikely that many great buildings were ever erected there, but for centuries it had witnessed those scenes of everyday life that are the common currency of human experience, from the time of the Romans up until the present day. For example, on 29 January 1807 a tremendous storm of hurricane-like proportions descended on the city, blowing several chimneys down onto the roof of the Royal Oak inn on Guinea Street, destroying the roof and killing a man named Humphreys, "a musician in the band belonging to the Montgomery Militia" who was in a room on the ground floor; on 14 October 1838 Julia Lamerton, the wife of a builder, died in Guinea Street and was remembered as "an affectionate and tender mother"; in December 1844 "Mr Morris Thurston of Guinea Street" died at his house having reached the incredible age of 108 years-old and who never allowed anyone inside his house for 60 years ; in 1856 John Webster was charged with leaving a waggon and two horses in Guinea Street and was fined 1 shilling; on 21 February 1859 Mary Smale was sent to prison for a week for "using abusive language in Guinea Street"; in September 1868 firemen had to put out a fire that was "raging in an uninhabited house in the lane leading from Sun Street to Guinea Street" and on 18 January 1874 a daughter was born to Mr and Mrs Chapple, etc. etc. People lived and worked and died in Guinea Street as they had for hundreds of years. On 04 May 1942 Exeter was blitzed as a reprisal for the RAF's attack on the Hanseatic port of Lübeck in Germany and Guinea Street was completely destroyed, along with much of the surrounding area. Only the outer walls of the Lower Market remained standing, being made of stone, until they were foolishly demolished in the early 1960s. 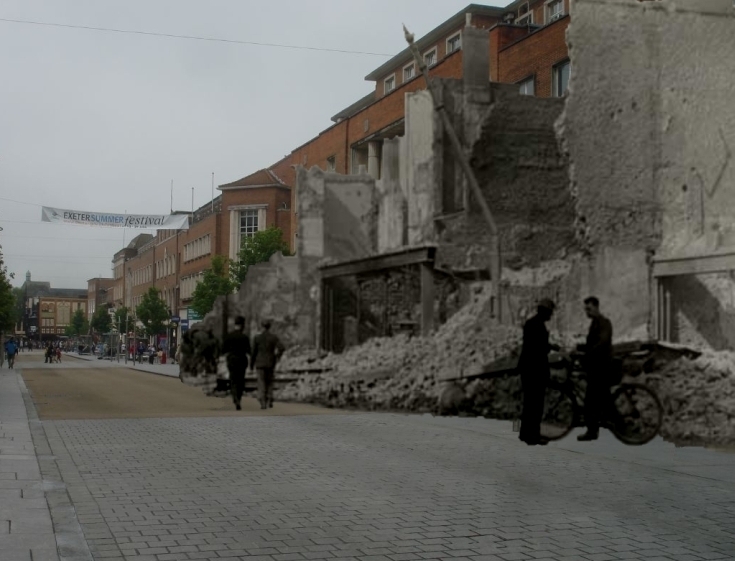 The photograph above right © Express & Echo shows Guinea Street, highlighted in red, several months after the devastating air-raid, the remains of one of the corner towers of the Lower Market clearly visible, pedestrians still walking on the old street's surviving pavements. Part of South Street is in the foreground, a faint trace of the very narrow George Street just discernible to the far right, running parallel with Guinea Street. It's impossible to say exactly what was lost in Guinea Street. Like much of the city at the time of the Second World War, no detailed survey had been undertaken of the street's buildings at the time of their destruction. 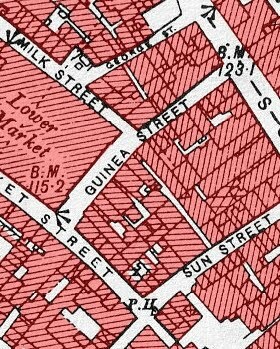 The bombing uncovered a previously hidden 14th century building in nearby Milk Street so it's likely that properties of similar antiquity had survived in Guinea Street up until 1942. The area was thoroughly redeveloped in the post-war period, although at least in Guinea Street the basic medieval street plan was almost retained intact. Before 1942 the street had a slight bend in it but after the war this was straightened out and what had been the junction with South Street was reduced to a short covered pedestrian passage above left. Now the eastern end of the street terminates visually with the backs of the post-war buildings on South Street. The real problem is the extremely poor quality of the post-war architecture. The area once occupied by the Lower Market is now an NCP car park. Brick-built and utilitarian, it has no redeeming features at all. The same can be said of the opposite side of the street, rebuilt in a style that is now common across much of the city centre: flat roofs and aluminium window frames randomly inserted into low-grade brick facades. The same type of building can be seen in long stretches of South Street, Paris Street, Sidwell Street, George Street, James Street, Market Street, Mary Arches Street, Bampfylde Street, Bude Street, Summerland Street, Verney Street and Cheeke Street. Anyone familiar with the Marsh Barton industrial estate on the outskirts of the city will recognise the style instantly. 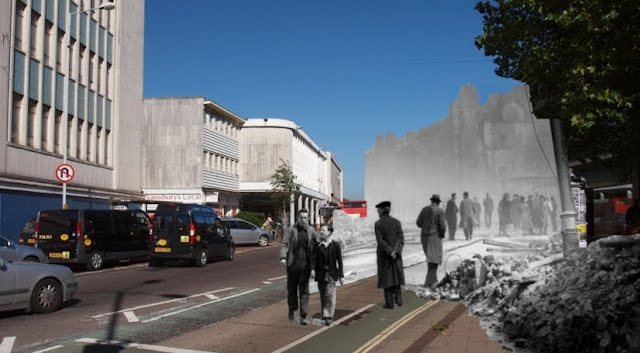 The sad story of Guinea Street has been repeated across Exeter throughout the 20th century, either as a consequence of war or as the result of deliberate demolition, and its effect on the city's historical landscape has been disastrous. 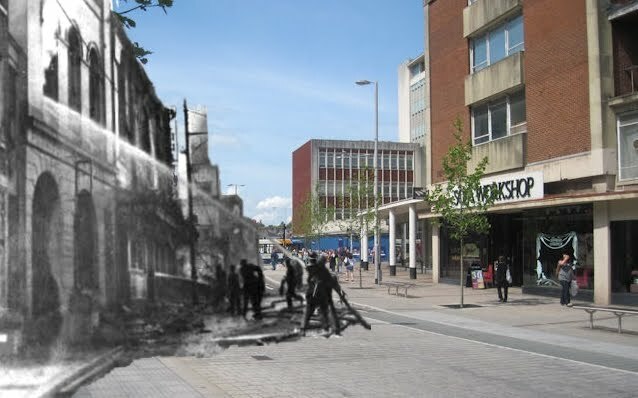 Comparing the photograph below with the watercolour at the top of this post, both from the same perspective, illustrates better than any words the sort of losses that Exeter has incurred over the course of the 20th century. 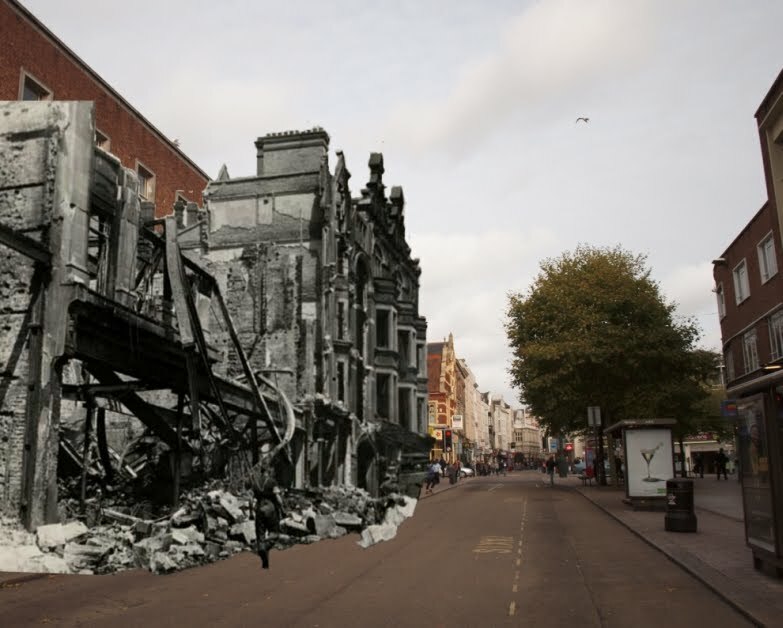 The following photographs all shows scenes of the aftermath of the Exeter Blitz of 1942 merged with views of the same streets today, e.g. Sidwell Street, above. I've tried to place the images of 1942 as closely as possible to their original position. 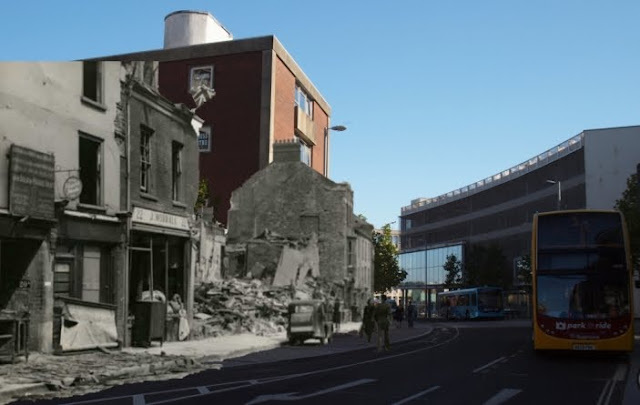 Goldsmith Street escaped the bombs of 1942 but failed to survive the attention of Exeter City Council in the 1970s, a period that saw almost the entire street swept away in the name of redevelopment. 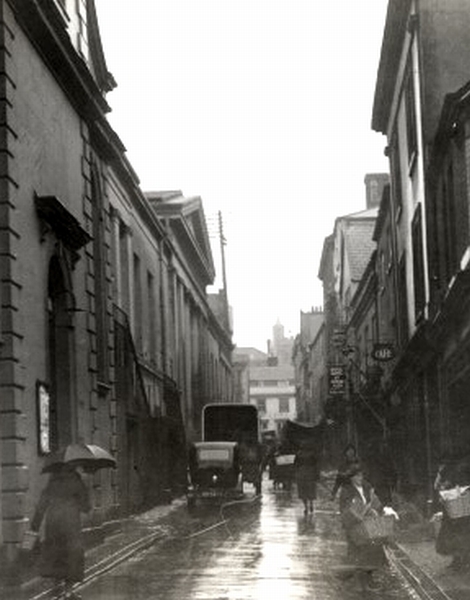 The photograph left © Devon County Council shows a rain-washed Goldsmith Street in the early 1930s. The view is towards the High Street from Paul Street (Webber's, a late-18th century building that was demolished in 1962 is just visible in the distance on the High Street, standing where Burger King is today). On the immediate left is the late-17th century St Paul's church. Its main entrance was through an arched doorway directly off Goldsmith Street (near the woman with the umbrella). Further up on the same side is the enormous neo-Classical facade of the Higher Market, accessed via steps with wrought-iron hand-railings. On the right are the facades of numerous shops and buildings, an almost continuous line of street frontages broken only by the narrow entrance into Waterbeer Street further towards the High Street. Apart from two buildings (No. 3 & No. 4 Goldsmith Street) and the central portico of the Higher Market facade itself, every single building shown has since been deliberately demolished and a 1000-year-old street wiped off the map. Wind the clock back over a millennium and people were walking along the route of Goldsmith Street in the 8th and 9th centuries as it was one of the streets laid down in the city by the Anglo-Saxons. 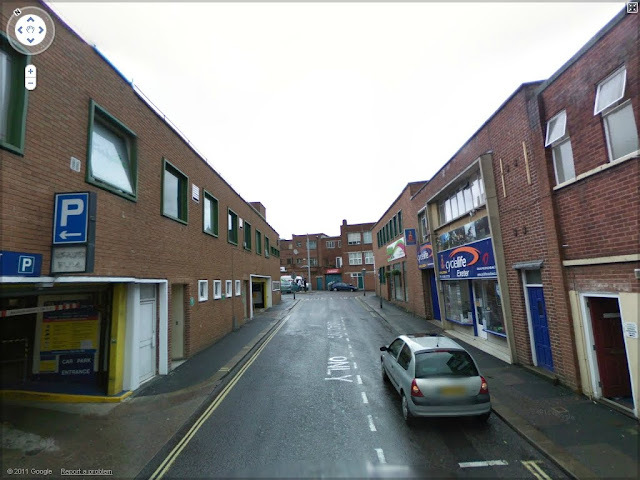 Gandy Street and wrecked Catherine Street are two other examples of Exeter's Saxon street plan. And before that Goldsmith Street was the site of barracks for the Imperial Roman Army when a fortress was established at Exeter in the mid-first century AD. From around the time of the Conquest in the 11th century until the construction of the Higher Market in the 1830s, Goldsmith Street's most distinctive features were probably the two small churches which stood sentinel at either end. The medieval foundation of Allhallows was sited at the entrance into the High Street until it was demolished in 1906. St Paul's church was on the corner of Goldsmith Street with Paul Street from at least 1066 until its reprehensible demolition in 1936. The drawing above right shows the view into Paul Street from Goldsmith Street c1830. The tower of St Paul's church is easily visible. The buildings to the right of the church tower were to be demolished a few years later for the creation of the Higher Market. The twin-gabled property near to the tower and almost hidden by a pent roof was probably Flaye's Almshouses. The street had been known for the number of goldsmiths' workshops since at least the 13th century. A document from 1291 names the church of Allhallows as the 'Ecclesia omnium sanctorum in Aurifabria' i.e. the church of All Saints where the gold-makers work. Apart from the two churches, there were at least two other buildings of known historical significance in Goldsmith Street prior to the construction of the Higher Market. One was Flaye's Almshouses situated adjacent to St Paul's church. The almshouses were founded and endowed in 1634 by one-time mayor of Exeter Thomas Flaye. His widow, Elizabeth Flaye, continued the endowment in her will of 1667. The almshouses in Goldsmith Street appear to have consisted of a large two-storey building with twin gables and an arched entrance which was subdivided into four separate dwellings for the use of four poor widows. According to Jenkins, writing in 1806, over the arched entrance way were "the Founder's arms, impaled with those of his Wife, with an inscription alluding to the foundation; over them is a winged hourglass, with other emblems of mortality; and the date of their erection carved on a stone table; over the inner entrance is another inscription." The drawing above left © Devon County Council dates to c1827 and shows a high-status timber-framed merchant's house probably dating to the early 1600s which stood in Goldsmith Street, probably opposite the entrance into Waterbeer Street. It was perhaps one of the properties demolished in the widening of the street in the 1880s. The image right shows a detail from Caleb Hedgeland's early-19th century model of Exeter. 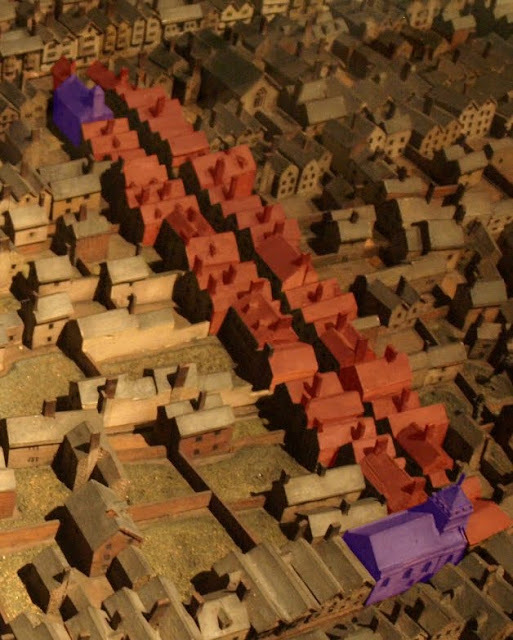 The houses which fronted onto Goldsmith Street are highlighted in red and the two churches are highlighted in purple with Allhallows to the top left and St Paul's to the bottom right. The rear of the barn-like 15th century hall of the Guildhall itself can be seen in the centre at the top. A parliamentary report of 1834 refers to "a banqueting house and house of office" situated behind Flaye's Almshouses. It's possible that this banqueting house was the other building of particular interest in Goldsmith Street: the Tailors' Hall. Jenkins recorded that the guildhall of the Company of Tailors was adjacent to the almshouses and "consisted of a convenient Dwelling-house, with a handsome Hall, for their meetings". The Company of Tailors had been granted the use of the hall and the house by Jane Tuckfield, the widow of another of Exeter's mayors, John Tuckfield, in her will of 1568. According to Peter Thomas, the Exeter Company of Goldsmiths and Silversmiths had their inaugural meeting in the tailors' hall on 01 August 1701. (Exeter was one of only seven English cities that had its own hallmark for use on all silver and gold which had been assayed in the city. The assay office in Exeter was created in 1701 and introduced Exeter's own hallmark of a triple-towered castle. Since the 1570s the city had been using its own town mark of a capital 'X' surmounted by a crown). One of Exeter's most talented goldsmiths was Richard Hilliard. He was the father of the prodigiously talented Nicholas Hilliard, goldsmith, jeweller and painter of the celebrated miniatures which depict the Tudor court of Elizabeth I. Richard Hilliard held the office of High Sheriff of Exeter in 1560 and was married to a daughter of John Wall, another goldsmith to whom he was apprenticed, and it was perhaps inevitable that his son was influenced by the intricate craftsmanship which he saw being executed in his father's workshop. 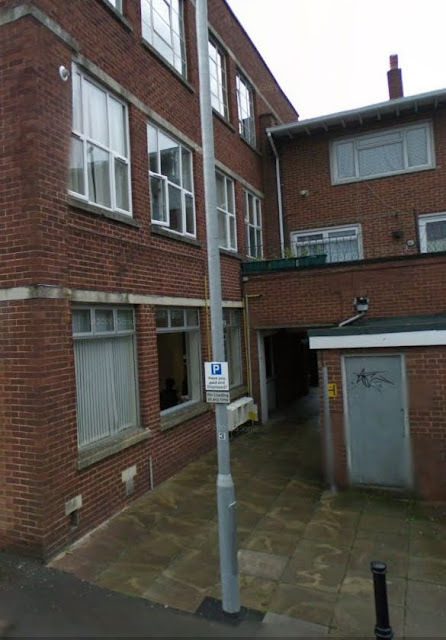 The exact location of Richard Hilliard's workshop isn't known but it's possible that it was in Goldsmith Street, although there is evidence that Richard Hilliard lived in the parish of St George in the West Quarter. 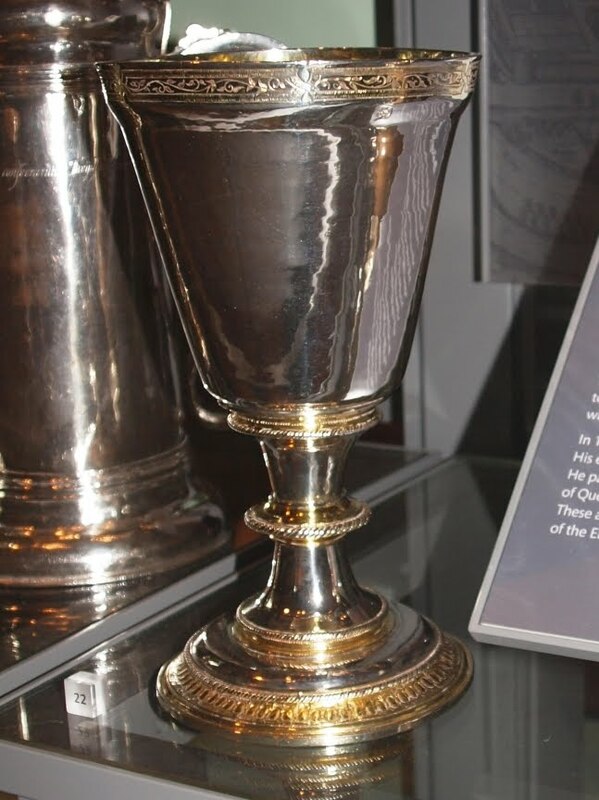 One of Hilliard senior's most accomplished surviving pieces is a communion cup made for St Sidwell's church in Sidwell Street around 1572. This very fine cup is manufactured from silver with delicate engraving around the gilt-edged rim and foot. It is currently displayed at the Royal Albert Memorial Museum in the city left. 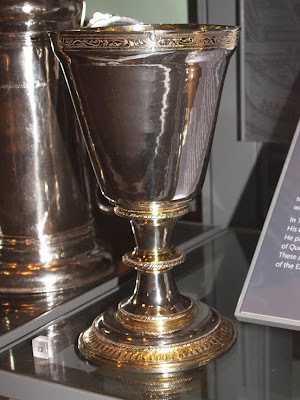 It's remarkable that this cup should've been made in Exeter by Richard Hilliard while his son was in London painting the portrait of Elizabeth I. The almshouses and the tailors' hall were both demolished in the 1830s when the magnificent Higher Market was constructed. The 230ft (70m) neo-Classical frontage towered over the narrow street which would've still retained much of its medieval character. 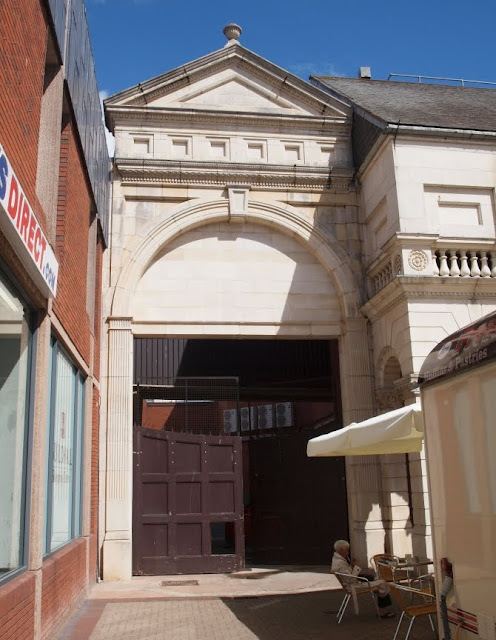 Entry into the market from Goldsmith Street was through a giant columned portico capped with a pediment. 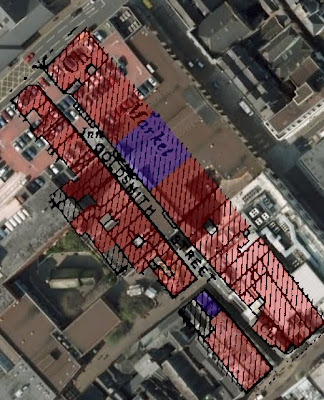 The floor of the interior of the market building was significantly higher than the street level outside necessitating the construction of a flight of steps to give access from Goldsmith Street. But the creation of the market also created its own problems. Throughout the 19th century the street retained its narrow width and increased traffic from the Higher Market saw numerous carts and horse-drawn waggons trying to enter the street from both Paul Street, the High Street and Waterbeer Street. 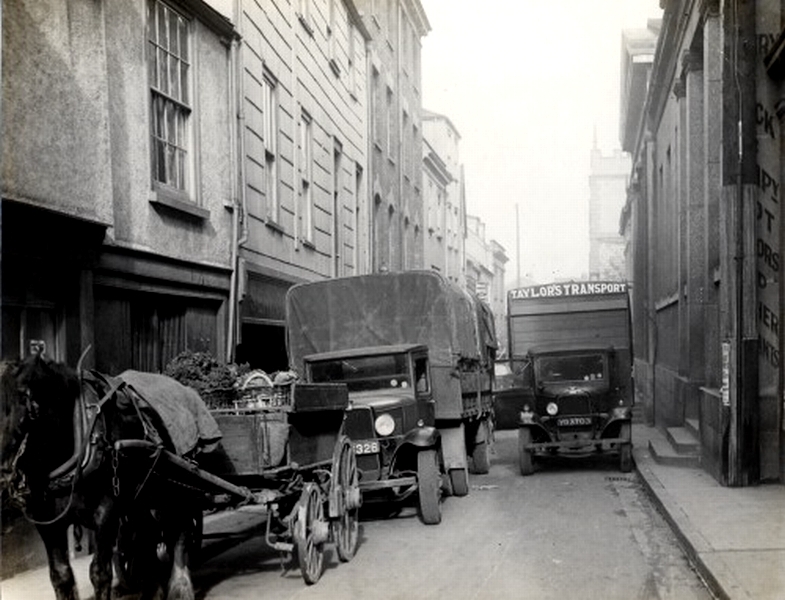 Another image from the early 1930s is shown above © Devon County Council. The Higher Market is to the right, the tower of St Paul's is just visible in the distance. The suggestion of a jettied first floor on the two properties to the far left suggests that they probably dated to c1600. The street remained unchanged until it was demolished in the 1970s. In 1852, a Mr Parish from Maddock's Row at the back of Paul Street "put back two feet the frontage of two houses situated opposite the market steps" in return for £26 paid to him by the Commissioners for Improvement. But the real catalyst for change seems to have been the death of 11-year-old Fanny Solomon, accidentally killed in an incident involving a falling ladder and a waggon in July 1871. The coroner reported that the "narrowness of Goldsmith Street, where there was considerable traffic" was a contributory factor and suggested that measures be taken to remedy the situation in order to "prevent a similar deplorable occurrence". 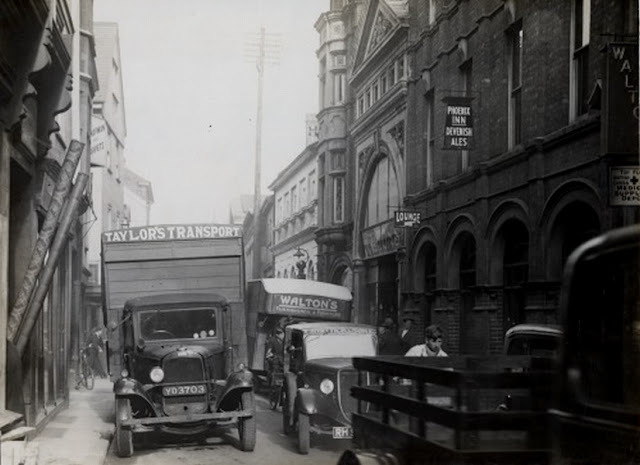 It was decided to widen Goldsmith Street by removing all of the properties between the corner of the High Street and the Higher Market itself. But it was a slow process. 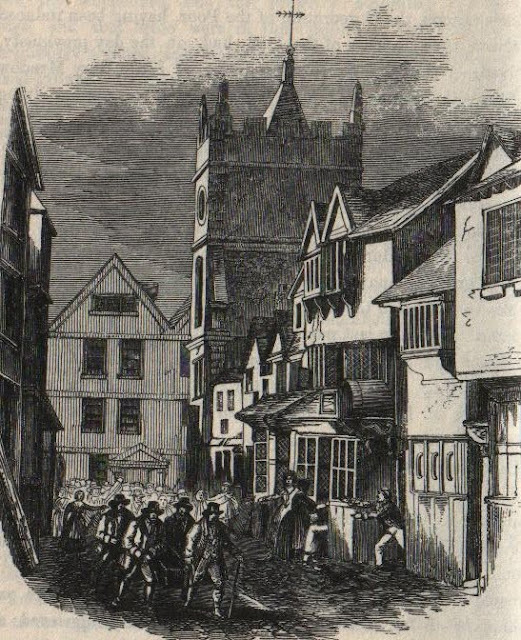 In 1875 Trewman's 'Exeter Flying Post' reported that the Commissioners had been in contact with the freehold owners of houses on the east side of Goldsmith Street and, "with one exception, they had found all ready to sell either the whole of the property or sufficient frontage to enable the scheme to be carried out." The great sticking point was the church of Allhallows itself. Despite being constantly threatened with demolition throughout the 19th century, the Dean and Chapter rejected plans for the church's removal, much to the annoyance of the city council. Eventually, in the mid-1880s, all of the buildings between the church and the Higher Market, approximately 190ft (58m) of street frontage, were removed. Allhallows church clung on until it was eventually demolished in 1906. The demolition of St Paul's church followed in 1936. New buildings were constructed to replace those which had been demolished during the widening of the road. These included the fine neo-Classical facades of the Wool Hall and the Phoenix Inn. The properties rebuilt after the 1880s road-widening are shown to the right in the photograph above © Devon County Council. Apart from the loss of its two churches Goldsmith street remained almost untouched from then until the early 1970s. In the late-1960s plans were unveiled by Exeter City Council for a new shopping centre, plans which involved the removal of the street. And not just the removal of most of the street's buildings, some of which dated to the 1600s, but for the eradication of the street itself. Between 1971 and 1979 Goldsmith Street was practically bulldozed out of existence. 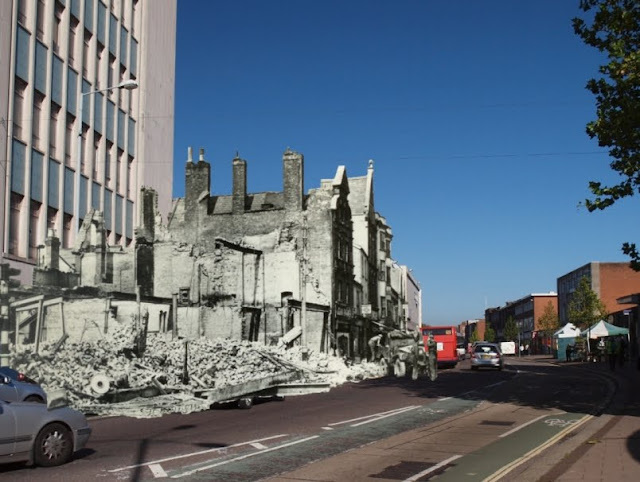 Thomas Sharp's post-war plan for the area in 'Exeter Pheoenix' show that he envisaged the demolition of many of the buildings on the street anyway, except for the Higher Market and those properties rebuilt in the 1880s, with Goldsmith Street itself widened until it was not dissimilar to Queen Street in scale. This was then supposed to lead via a pedestrian subway under the High Street into the Cathedral Yard itself. The scheme was never implemented as Sharp foresaw but the buildings were demolished all the same. The image right shows a detail from the 1905 map of Exeter overlaid onto a modern aerial view of the same area. The High Street entrance into Goldsmith Street is to the bottom right. Buildings demolished since 1905 are highlighted in red. Apart from the two churches at either end of the street, nearly all of the demolition occurred between 1971 and 1979. Only part of the Higher Market and Nos. 3 & 4 remain today, highlighted in purple. 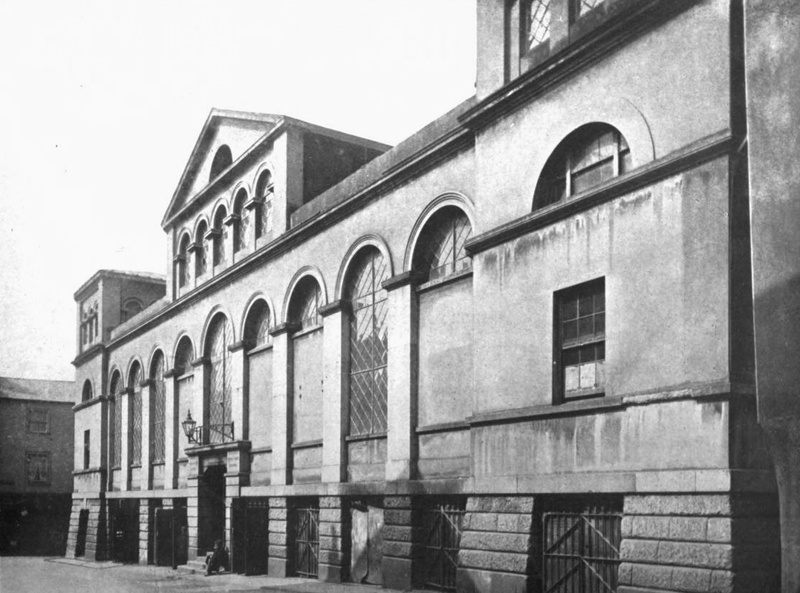 The majority of the Higher Market's Goldsmith Street facade was demolished, irreparably defacing one of the finest 19th century market buildings in the west of England. The ground level outside its remaining entrance was raised, burying the base of the columns and destroying the careful proportions of what was left of George Dymond's original design. Apart from No. 3 and No. 4 Goldsmith Street, all the buildings on the side opposite the market were also destroyed, a number of which had been granted Grade II listed status and which, taken as a whole, accounted for one of the few areas of the city which still retained its pre-war atmosphere. There was No. 1 Goldsmith Street, a late-18th century building spread over four floors with pilasters at either side of the facade stretching from the first floor to the parapet at roof level. Despite being granted Grade II listed status in 1974 it was demolished in 1979. No. 13 Goldsmith Street was another listed building, 17th century in origin with an 18th century facade. Formerly the Bull Inn, it too was demolished. The neo-Classical facades of the Wool Hall and the Phoenix Inn were salvaged. 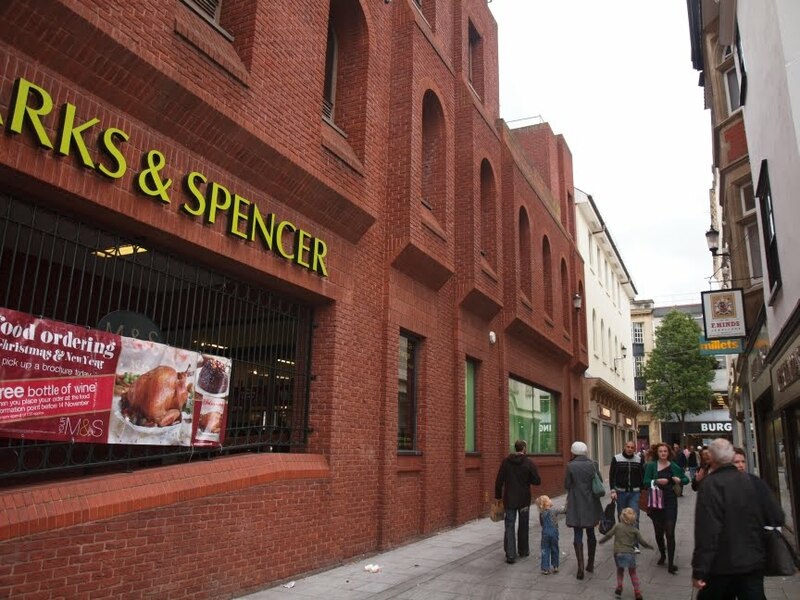 Re-erected in a different position the modified Wool Hall facade now forms the entrance into Marks and Spencer. The relocated Phoenix Inn facade below left arches over the service entrance into the same building, minus the reclining figures which once lounged in the spandrels of the arch. On a profound level the heritage of the city was simply obliterated: many of the destroyed properties in Goldsmith Street still respected the narrow burgage plots of their medieval predecessors. The remains of Roman buildings were discovered underneath 14th century pot shards. The thousand-year-old entrance from Paul Street was built over with modern retail space (now WH Smith). None of the properties opposite the market were rebuilt, the result being an open public area with more retail space cutting the course of the street in half. Nearly 1000ft (300m) of pre-war street frontage was demolished and today only a quarter of the original course of the street remains, on which stands just two surviving pre-war buildings. This was nothing to do with slum clearances or the Baedeker Blitz of 1942, or the immediate post-war reconstruction or of the construction of the inner bypass, or of the flood prevention scheme, all of which had already destroyed vast tracts of the city. As Gavin Stamp quite rightly claimed: "despite all the cruel losses of the Blitz, Exeter was still prepared to sweep away distinctive and interesting old buildings". Put into the context of the destruction which had preceded it, the decision to demolish Goldsmith Street so comprehensively is unfathomable and unforgivable. Had it been renewed with imaginative restoration of its buildings then the street would've been as popular with independent retailers and as characterful as Gandy Street is today.